All of us though may not be shopaholics but always want to search for great deals. After all what is the harm to save a penny when you are draining your pocket any how. But an apt coupon or a deal can certainly make your day. Do you agree? Whenever we shop from e-commerce sites like Amazon, Myntra etc, most of the times we go for those products that we think are priced the lowest on that particular site. So why not to take a step ahead and find out the deals first and then shop? 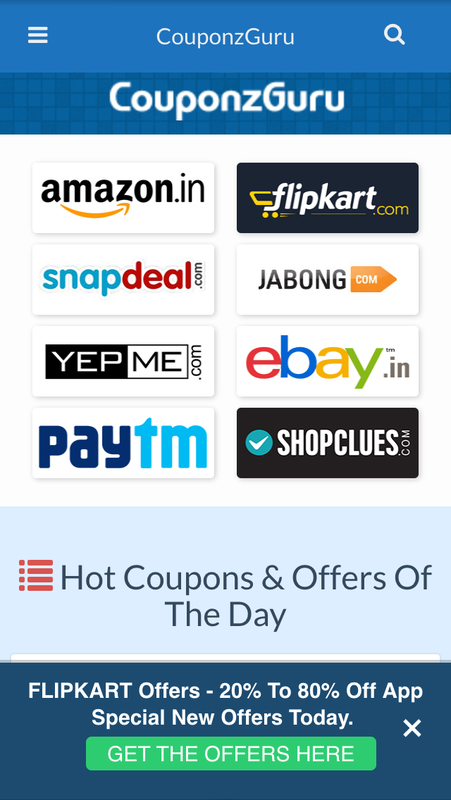 When one such day, I was surfing to find a voucher codes for Jabong as what is the harm in finding a better deal, I came across Couponzguru.com. I was thrilled to see so many deals lying out in open in front of you. Asking you to pick up the one that suits you. It was like going to a market to buy your favourite chocolate and the shopkeeper announces that today everything is on 1+1. They have this tendency and which is worth mentioning that they update their site with the best offers you can avail from the sites likes Freecharge, American Swan and what not. So probably, you will never be disheartened of the expired coupon again. As one can possibly never find a stale deal on their website. In fact, I even liked that how they have distributed different brands and have showcased all the deals for almost every possible category. These are just a few that, I did a screenshot from my phone. But you may not be even aware of that deal until you land up on Couponzguru.com. But, you must know that the deals they give you for free are not something that they create. They just introduce you to the deals going around on different platforms. They are the curator of the best deals. 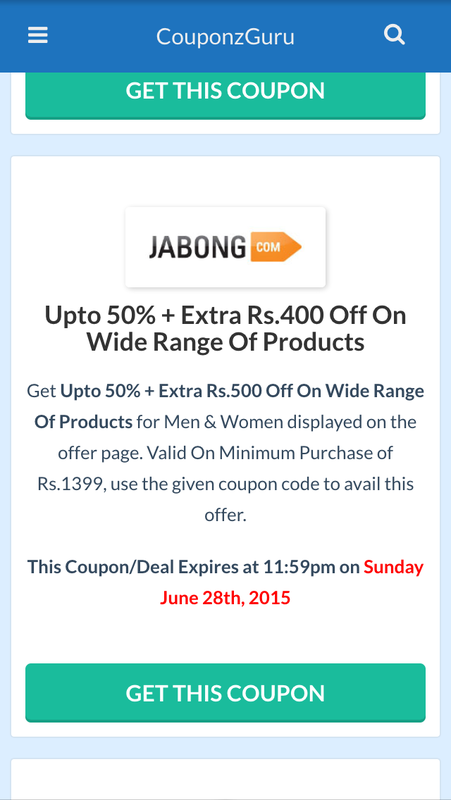 Like when, I clicked on the deals available for Jabong, I was directed to the brands website where the deal was already on. So basically it’s a platform where you can choose and select the deals for your perusal and not where you can avail those discounts. Well, is it not great to first get to know the offers that are going around and then accordingly setting the bar to shop? When you open the webpage they ask you to join for their daily newsletter. 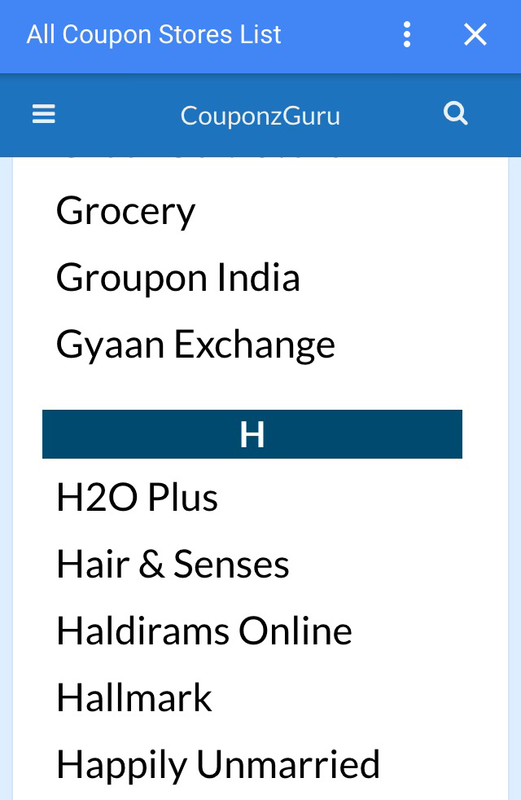 Imagine, your inbox filled with the deals of your favourite e-commerce sites. What more can you ask for? You may ask for other free coupons by which you may not have to pay a single penny but if that would have been the case, then would you not be a Guru. You can see the full details out here of how a coupon or a deal are showcased. I believe they want their customers to be highly satisfied with them and I appreciate it. Go for this website if you want to save a penny. 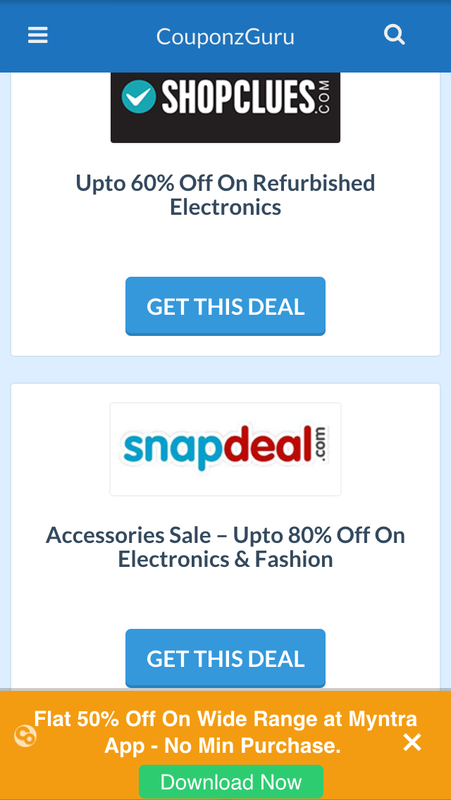 As if that offer is not available on one e-shopping website, it may be there on another. Instead of opening up different tabs, Couponzguru.com should be your destination to know about all the deals. I will now prefer going through this site before shopping. What about you?